In ancient times, the horse was a very important animal. The samurai and the royalty who had a high income donated live horses to Shinto shrines. 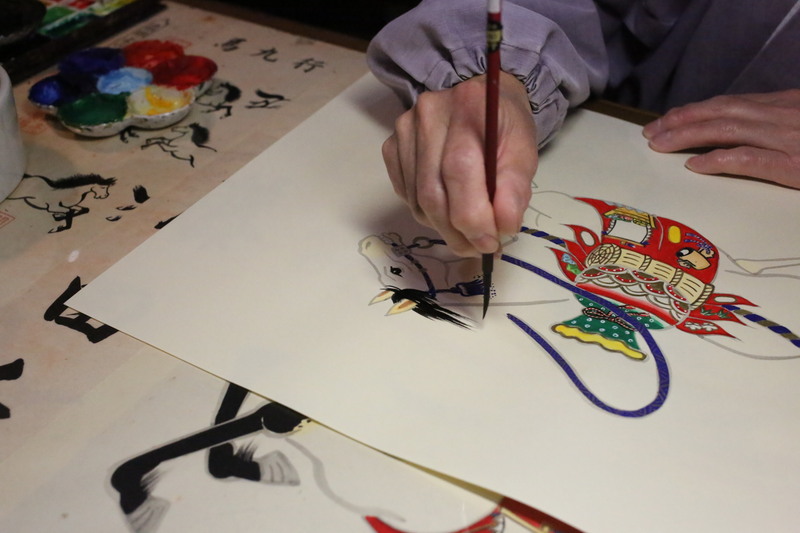 In the Edo period, this custom expanded to the common people. They donated horses made of wood or clay. After that, people donated drawings of horses on wood or paper. We call them ‘ema’. ‘E’ means drawing and ‘ma’ means horse. 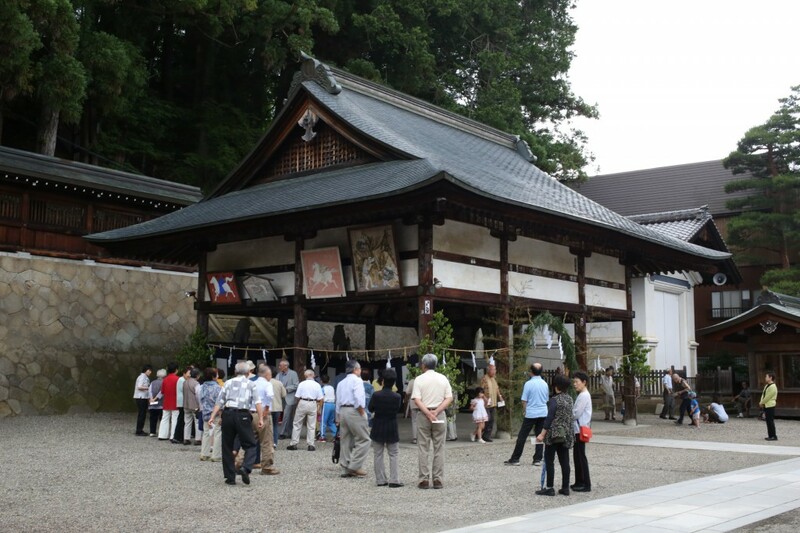 There is a building in a Shinto shrine that displays many votive ema. Also the horse was like a member of our family in Hida at that same time. We prepared the room which had the best exposure to the sun for the animal and called that room the ‘maya’. ‘Ma’ means horse and ‘ya’ means room. Horses protected our houses too. Some houses had horses until the 1960s. However, the use of horses has declined more and more from the earlier high-growth period. People got used to having a car, so they didn’t need to have horses. Now it is unusual to see horses in our lives. 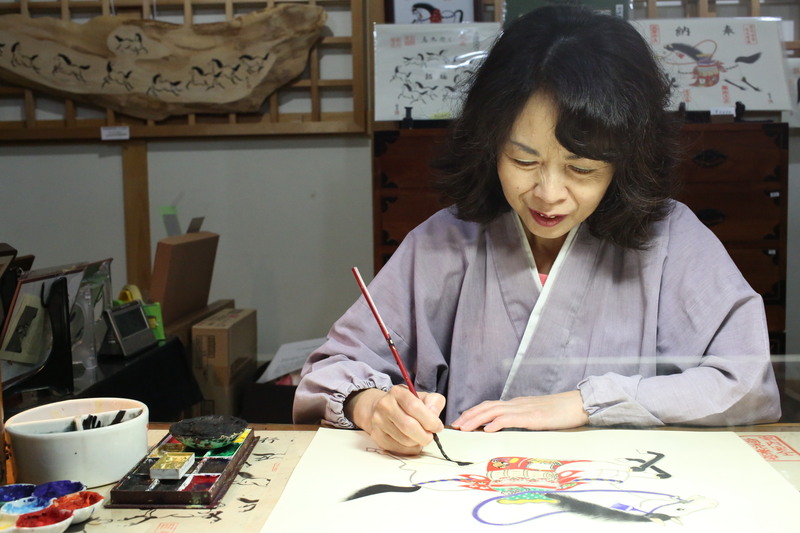 Ms. Suisei Yamaguchi is a specialist in drawing ema on paper. She began to learn to draw ema when she was 20 years old, and she has continued doing it for more than forty years. She has been drawing all of them by herself, even though it takes her approximately a day to draw one piece. If you see her drawing, you can sense that she really loves horses. Her drawings look very happy and peaceful. All the colors are vivid and fresh. Her horses look like figures which run with good luck. 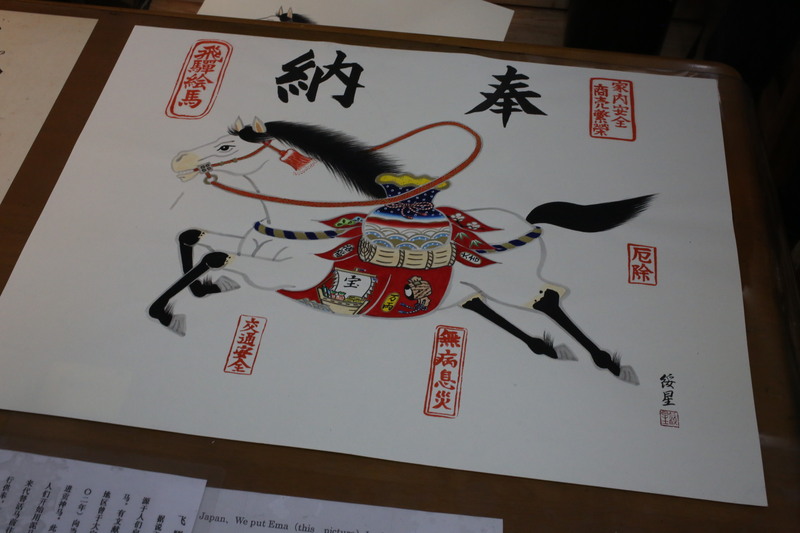 Ms. Yamaguchi has decorated horses’ saddles with some positive motifs, for example, a rice box, a treasure-ship, a mallet (sign of money) and auspicious plants like pine, bamboo, and plum. She draws each individual hair of the horses’ manes and tails. I can see the wind blowing in the horses’ postures when I look at her drawings. You can see examples of ema on almost all houses and restaurants in the Hida area when you come here. There is one thing to note. When you decorate the entrance of your house with an ema, the horse’s face has to turn toward the inside of the house. Ms. Yamaguchi prepares drawings that are turned both right and left. You should choose one that suits your house. Now you can buy one at the Ema-festivals. In the case of Furukawa, there is one at “Santera-matsuri” on Jan 15th; in the case of Takayama, you can find one at the beginning of August. The horse lives in the hearts of the inhabitants of Hida, even though nowadays there are few horses in this area.